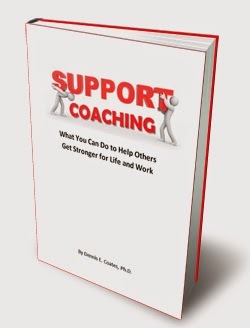 A special ebook, Support Coaching, is available free online to anyone involved in helping others learn and grow stronger for the challenges of life and work - life coaches, business coaches, executive coaches, athletic coaches, consultants, trainers, teachers, counselors, parents and others. It's the only resource that addresses all these skills, with none of the fluff and storytelling to wade through to get to the meat. The content focuses strictly on the how-to. But a book is only a book, and you can't get better at doing something if you just read about it. No matter how many books you read, it won't make you a better swimmer, it won't kick your tennis serve up a notch, and it won't get your golf scores under 90. People skills and coaching skills are no different. If you want to improve these skills, you have to practice them. So let me tell you the best way to use this ebook to become a better coach. I recommend the Focus-Action-Reflection approach imbedded in ProStar Coach, the online personal development service. First, FOCUS. Work on one skill at a time. I suggest you pick the coaching skill you'd like most to improve. Go to the chapter in the ebook that describes the skill and study the model. Identify one aspect of the skill you'd like to work on. Next, ACTION. Make a plan to use this aspect of the skill in your work or your personal life. For example, if you're a parent, maybe you feel you have trouble sensing the "listening moment." Make a plan to do that the next time your child wants to tell you something. When the opportunity presents itself, carry out your intention. Maybe you'll handle the situation well. Or maybe not; maybe it won't go as you expected. You might even fail completely. No matter what happens, the third step is REFLECTION. Learn from your experience by thinking about it. In another post I describe the "5 Magic Questions" that will help you identify what went wrong and how to do better next time. I also explain this "learn from experience" process in a video. Then cycle through focus, action and reflection again. Go back to the chapter in the ebook, review the model and think about what you plan to do next time. Then follow through with real people. Afterwards, reflect on your experience using the five questions. It will take many repetitions of focus, action and reflection before the behavior pattern you seek becomes your natural, automatic way of doing things. So if you coach people and you'd like to be more effective, get the free ebook,Support Coaching. But don't just read it and appreciate it. Put one of the best practices into action. Commit to implementing many cycles of focus, action and reflection. This is how you learn from experience.